There are two methods for setting up block scheduling depending on the Kareo system you're using, 1) Kareo Platform or 2) Kareo PM. Click "calendar settings" from the calendar view. Then click "office hours" from the left menu. Click "edit" next to the person's name you want to configure a telemedicine timeblock for.Add a "break" for each day and time you'd like to designate telemedicine blocks. Be sure to title each break "telemedicine." 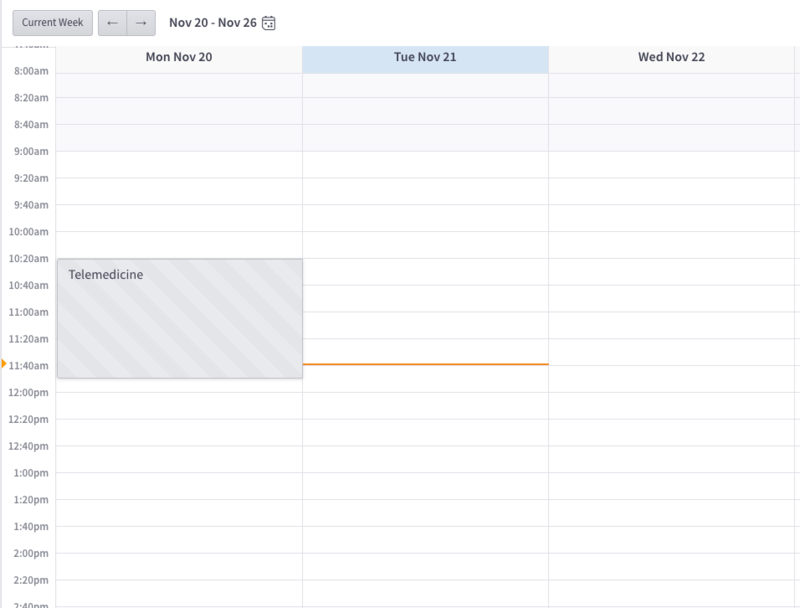 Finally, click "save and finish"
Your calendar will look like the image below with certain blocks set for telemedicine. When scheduling appointments you will schedule exactly like normal appointments but for the times blocked by the telemedicine slots. Click "edit" next to the person's name you want to configure a telemedicine timeblock for. 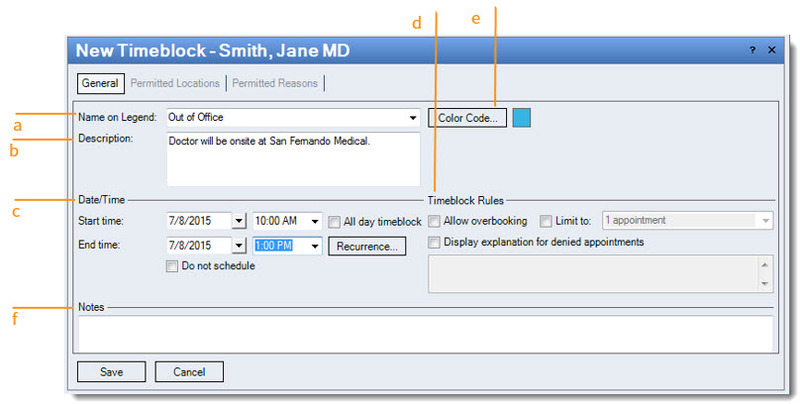 Add timeslots for each day and time you'd like to designate telemedicine blocks. Be sure to select "telemedicine" as the location from the drop down. Description: Optional. A description entered here will appear as a tool tip when a person hovers his or her mouse over the telemedicine timeblock reason in the calendar legend. Date/Time: For a single occurrence, enter a start/end date and time or check the "All day timeblock" box. For multiple occurrences, click Recurrence to set the pattern. Check "Do not schedule" if no appointments are to be scheduled during this telemedicine timeblock. Checking this box disables the Permitted Locations, Permitted Reasons tabs, and the Timeblock Rules options. Timeblock Rules: Optional. Set rules for the following by checking the appropriate box. Allow overbooking - Multiple appointments are allowed during the timeblock. Limit to - Limit the amount of appointments allowed during the timeblock. Select the number from the drop-down menu. Display explanation for denied appointments - Enter the explanation for the denied appointment; this message will be displayed to the person who attempts to schedule an appointment that breaks the telemedicine timeblock rules. Color Code: Optional. Click to open the color pallet and select the color for the telemedicine timeblock. Notes: Optional. Enter any notes about the telemedicine timeblock. Allow Only Specific Locations: Select to apply timeblock to one or more specific service locations. In the drop-down menu, select "telemedicine" and click Add. To remove it from the list, right-click on the service location in the box and click Delete. 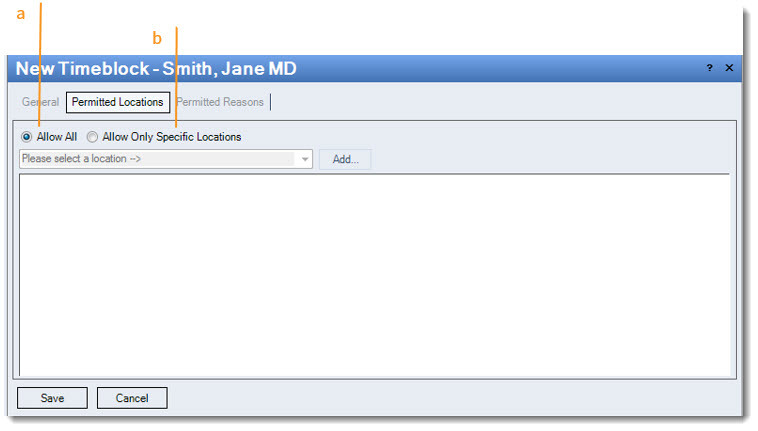 Allow Only Specific Reasons: Select to allow scheduling during a telemedicine timeblock only for specific reasons. Allowed Reasons: When "Allow Only Specific Reasons" is checked, select reasons in the drop-down menu and click Add. To remove it from the list, right-click on the reason in the box and click Delete. Deny Only Specific Reasons: Select to deny scheduling during a telemedicine timeblock for specific reasons. 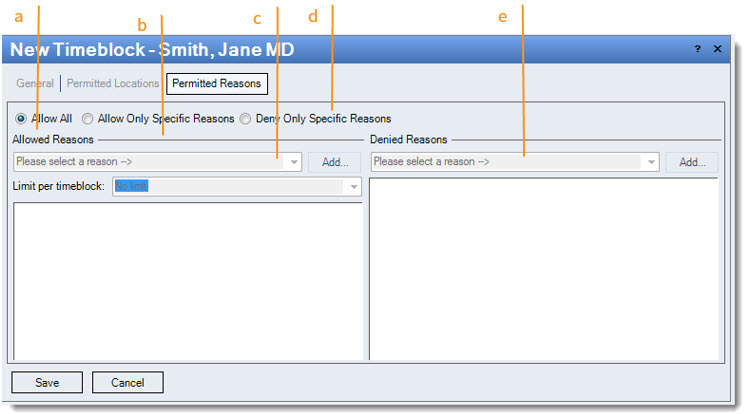 Denied Reasons: When "Deny Only Specific Reasons" is checked, select reasons in the drop-down menu and click Add. To remove it from the list, right-click on the reason in the box and click Delete. The blocks of time you set up here will show up on the Appointment Scheduler. Name this block, "Telemedicine". You can also configure recurring telemedicine timeblocks, establish scheduling rules and define permissible scheduling reasons. There are three Timeblock Calendar views: Daily, Workweek and Weekly.